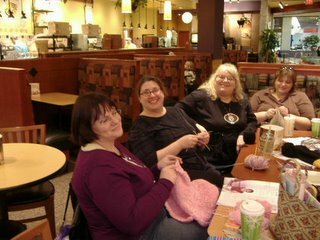 Anyway, it was so great to finally meet all of my Western Pennsylvania knitting blog friends! What a great group of people. I met Judy, Donna, Heather, Cheryl, Nora, Yvonne and Jane. Unfortunately Judy left before I thought to get the camera out. I missed seeing Laurie and Natasha... maybe next time??? 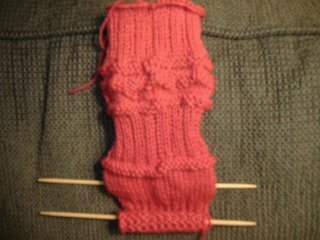 After purchasing the yarn bobbins, the intarsia thing became clear. I'm glad I didn't give up because, in reality, it's pretty easy. I could not put this little sweater down last night. I was exhausted and vowed to go to bed early but I could not stop knitting on this. It just keeps getting cuter by the minute. That bathroom is never going to get painted at this rate. I started these socks just so I'd have something semi-mindless to work on at Panara Bread on Sunday. They look a little funky. I think I'm bringing back slouch socks from the 80's. I was supposed to stop after that last garter stitch ridge but I don't like my socks that short so I added a few stockinette stitch rows. We'll see what happens. They will be my Valentine's Day socks. So, in real estate news, today is the biggest closing of my career. I'm a nervous wreck. I know all the i's are dotted and the t's are crossed but still it's just so nerve racking. And my boss is at Disney World with his family so if anything goes wrong, I'm on my own baby! No wonder I knit. You have to do something to maintain your sanity in this business. Congrats on the biggest close of your life!!! Celebrate! It was nice meeting you, too!! I wish you lived closer. It was great to meet you Holly. Congrats and good luck on your close. It was nice to meet you last night. It is far better than to work on relationships than it is a house...at least that is what I tell my husband. 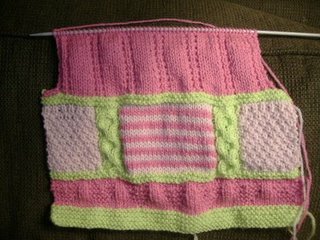 I can't wait to see you finished baby sweater -- love the pink and green in all those patterns. I hope your closing went seamless! I really like Nora's comment on how it is better to work on relationships then a house... that can be applied to many things in life. The sweater is beautiful! I still don't quite understand how the two colors side by side connect... I didn't look at it close enough but the colors make me drool! Very lucky baby to have you as an aunt! it was GREAT to meet you Holly! 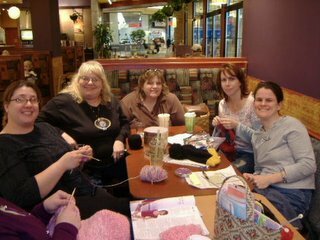 I hope we all can get together again soon!